Yesterday though, two rare things happened. First, I took a day off. A whole day off. Not that self-employed kind of day off where you just work less than you usually do and call it a day off, but a real, honest to goodness day off. Madrona happens this coming weekend, and as is my habit, I took a few extra days to work with Tina here on the west coast before we go. Saturday I flew in, she picked me up and we settled in one of our favourite places to be. We’ve both been under a lot of stress these last few months, and decided that we could use "a day off". (Actually, a lot of people told us we could each use a day off, so maybe we were getting weird.) In any case, we thought we would try it. One whole day, without work, without feeling bizarre or guilty about it. I’m out of practice with the whole day off thing, but in the end, we both managed. We spent the entire day knitting. We watched Stargate SG-U and Castle , drank beer and knit. It was grand I tell you, just grand. The second thing that happened is that Tina, who loves photography and has quite a knack, got rather obsessed with taking pictures of the Wild Apple Bohus while I was knitting it. The resulting pictures are too pretty not to share. (Yes. I’m wearing pink gnome jammies and a "knit.calm" tee-shirt. It’s high fashion around here. Try to over look it. Focus on the bohus.) I love these pictures. There’s something neat about how my knitting looks from the outside, rather than I how I perceive it from the inside. Three rounds of the yoke to go. So pretty indeed. It’s exactly as beautiful as I imagined,but far less bulky. Sabbath is a good thing. I’ll bet the last time you got a full day to do only what you wanted was when you were very young and home from school sick. Thus the off kilter feelings, but don’t worry, it won’t last! The colors are just great. Some day when I grow up I hope to be able to knit like that. Great job for the both of you. Enjoy. Those colors just jump off my monitor–pretty! How many yarns to you have to handle it once. It’s really beautiful. Fantastically beautiful! And a day off wouldn’t be a day off with out jimjams! Since you’re in the right state, if you have another free day check out one of the Korean day spas. Here’s the one I went to with my best friend for a girls day (there is also one in Tahoma and Seattle). We each had a body scrub, massage and wrap plus all of the hot tubs and saunas. I think I was jelly afterwards. Glad you both had a day to put your feet up and RELAX without the usual/unusual daily demands. Those pictures are so wonderful because they do look restful, but only you would be resting with so many strands going at once. Glad you have each other, and had a day off. Thanks for sharing it. Lovely, just lovely. I’m so glad you two took a day off and just did what you loved. There is much to be said for a little renewing of the spirit. Wow! The thing I think is impressive is how nice the floats look. Everything I’ve ever attempted with color work looks like tangley-fruit-loop-vomit. I salute you and your excellent floats. your hands look so young! Just beautiful! I hope you have a great trip! I LOVE CASTLE! And the Bohus is looking awful pretty. I love the colors in that sweater. That is too many yarns for me to keep track of. I’ll just admire yours from afar. Wonderful to have a day off to knit! 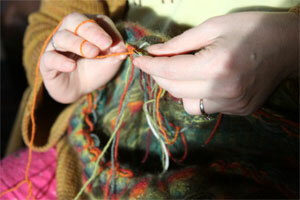 !I am always interested in how different kniters do their floats..
Lovely pictures, Tina! Lovely work, Steph! Love the idea of the day off for both of you. I really need to order that kit. I haven’t a snowball’s chance in *he double hockey sticks* of being able to actually knit it, but I have to have those skeins in those colours to look at on a daily basis. Back to swatching my Peacock Tail and Leaf Scarf from Knitted Lace Of Estonia. It’s one of my Olympic projects. The other is My January RSC kit(thank you Tina), but I haven’t decided which pattern yet. The yarn is in balls though and ready to go. Cheers and red wine, hazel. Those are absolutely beautiful colors! And kudos to you for a day off — I’m sure you deserved it! My husband has the biggest man crush for Castle. Love the sweater. How pretty! I’m not confident in my skills to do something with so many yarns;so, I will just admire yours. thanks for sharing. You did not need to bring attention to the PJ’s. Would not have noticed due to the wonderful knitting. Focus on the Bohus? Wow. That’s awesome. Steph, that is so pretty! Colourwork intimidates me in general. Yours inspires me. I hope you enjoy the evening off too! The bohus photographs beautifully. It looks like a fluffy little cloud. Gorgeous! The day off thing sounds awesome. I haven’t had one of those in a while. I did take a couple of hours yesterday. That was nice. Gorgeous! I didn’t even notice the pj’s until you mentioned them, Stephanie. Hope your day off was restful and peace bringing. p.s. I <3 Castle! Great photos, good company, excellent choice of leisure activities and wear! Awesome use of day off! ps – you needed a day off! My favorites are those top two photos – especially the one where your wedding ring catches the light and sparkles while you knit. I hope you enjoy our “un-winter” here. We’re on something like day 41 of above normal temps (at least in the Seattle area – not sure about Portland). Gorgeous. Those colors sing to me. wow…. those really ARE beautiful pictures! can’t wait to see it in all its final, completed glory! I remember when he was a teenager on One Life to Live (which I was hooked on in college). Now he plays the FATHER of a teenager. Plus, watching the Grammy’s the other night made me feel like I was too old for music. It’s not right, dawg. Absolutely beautiful. All those strings of yarn hanging kindof made my heart flutter. I am in awe! How do you keep all the yarns from tangling into a gigundus knot? Your knitting prowess and speed has always impressed me….now I only have one thing to say ( from a kneeling position) I am not worthy! I love the colors! Can’t wait to see it finished. Beautiful sweater…. but realllly important question. Did you see the Castle where Castle comes out in the Captain Tightpants outfit from ‘Firefly’? Looking forward to seeing the sweater when the yoke’s on you! 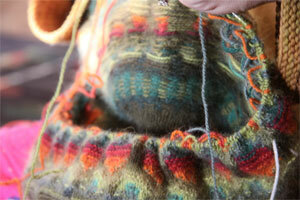 Love the Bohus, not sure I understand how its done, but I am clever and will eventually figure it out. Out of respect for both you and Tina, I am going to take tomorrow off..the full day and knit. I have been acting a little weird, hopefully it will pass with some quality knitting time. Gorgeous Bohus. I wish I could spend a day knitting with Tina too! Although, in a way, I have: I’m on my seventh hat using her Silkie yarn for a family of eight kids who could use to be comforted with softness and caring right now. So I’m sharing a little Tina with them. Oh, that day off thing sounds so good! I might just have to try it sometime soon. My husband and I have our own business, so that means very few days off. We are also very invilved with a Boy Scout troop, which takes up most of those days off…I think I might have to try for a real one. Gee, my day off involves a nap. There are few things better than an honest-to-goodness rest — glad to hear that you were able to enjoy one! Tina takes gorgeous pictures! I can’t see any gnomes…..
It’s so beautiful – the halo is lovely. It sounds like a wonderful day off. Beautiful! I can’t wait to see it finished. I LOVE the sweater! it’s so pretty! Oh, and Tina can take nice pictures too! You two even do a day off well! Gorgeous Bohus and equally gorgeous pictures of it. Spending the day in your jammies, knitting and watching Castle is a day well-spent! Glad you enjoyed it! do you do stranded color work with one strand in the right hand and on in the left (i.e. english+continental)? or if not, what do you do? how do you keep your stranded knitting from “cinching” in? i ask this because i recently ordered a bohus hat kit and i’m worried because my fair isle stuff always comes out so tight that i need to give it to a child so it will fit someone. i’d like this hat to fit moi so . . .
anyhoo congrats on the day off. i’d be jealous if we didnt have a snow day today AND tomorrow. knit on! Wow! Its gorgeous and scary! Seeing all those color strands waiting for their turn on the needles makes my head spin. Thank you for sharing your wonderful work. What? You are in Tacoma and I didn’t know it?! Now I am sad. 🙁 I would have loved to meet you and take one of your classes! Well, enjoy! The sun is shining today! You both need to get a facial and a massage if you really want a day off. You’ll feel fabulous. I love the colors of Bohus. They make me think of springtime. Its only white and grey here in Indiana with 10 more inches of snow on the way. I think I’ll curl up in front of tube tonight and listen to the witty banter on Castle to escape Winter. Hold on to your Bohus…my teenage daughter thinks she has just elevated in coolness. All because she, too, has the exact gnomey jammies that the Yarnharlot herself wears. You are a teen idol. Believe it. I am told that everyone should have a pair. Except me, of course. I am too many leagues from cool to be eligible. She is wondering, however, if you have the Club hat? This is essential, she maintains. Let us know. Feel free to print this out and flaunt to your own teens. Those are wonderful pictures of amazing knitting. The pictures would make really cool screensavers. You deserve a day off. You deserve more than one. Thank you for all you do. Love the jammies! I also love your take of ‘high fashion’. Nice pictures of such gorgeous colours. I remember your other Bohus. You had it on when you were in New York, releasing one of your books, and Joe was in the audience which was a surprize to you! Wish you could see Vancouver today. Everyone has a Canadian flag on their car – even the ambulance driver. Someone has erected a giant cdn flag in the British Properties- it can be seen from quite a distance. I am so excited to be here for the Olympics. While I am volunteering, I could use your bohus sweater. It is cold standing there. Yay for a day-off! And such gorgeous photos! Thanks for sharing!! Hopefully you can squeeze in a few more beers and rest before Madrona! It looks so delicious and fuzzy and lovely, I just want to shove it in my mouth! But then it’d be all drooly. You and Tina need more days like this one. Cheers ladies. Well earned doesn’t begin to cover it. Cannot remember the last ‘real’ day off I had. Usually a day off for me means that I get to run errands without taking the children. Glad that you were able to have one. I love the Bohus. I knit 3 sweaters last year & frogged them for one reason or another mostly fit issues – my Olympic Challenge is to make Cosmicpluto’s Top Down Raglan Cardi – fingers crossedthat it fits! I have those exact same jammies. Great minds and whatnot. Beautiful Bohus. Beautiful photos! Enjoy your time. I LOVE CASTLE!!!! A whole day of Castle & knitting….mmmmm…. Gosh, Steph, you set us up for pink gnomes and we get to see nary a one…but that Bohus sure looks yummy. Happy one-day vacation! I remember those crazy hectic years…be sure to stop and smell those roses every now and then. Those colors just glow. I hope your time was restful and refreshing. I get days off…..but every time I do, SOMEBODY (read that – husband) plans my day off for me. “Hey! Let’s re-tile the bathroom, or hang drywall in the office, or clean the garage!” For some reason, he never wants to knit and watch Doctor Who videos with me on HIS days off! Holy Shmolies! I was impressed before by the bohus, but it looks better in the close ups. Congrats for actually taking the day off. That is a skill that most of use need more practice at. AND a whole day of knitting, beer and friendship! Good for both of you for taking the time to enjoy. PS, I never would have noticed the gnome jammies if you hadn’t mentioned them. Gorgeous. It’s great to knit somewhere where your laundry is not. Thank you for sharing the photos. They are extremely well edited. What gnome pajamas? I can’t take my eyes of the gorgeous colors. Knit on! Castle is right up there with Chuck on my greatest TV shows list. AND Nathan Fillion is another one of my favorite Canadians! Beautiful knitting! The colors do just jump off the monitor. Looks like a perfect day off. I love the jammies, but I have to ask – what’s a knit.calm t-shirt? If your hideaway was the one at the beach and your day off was this past Sunday, you were indeed granted a treat. It was so beautiful that day. I hope you’re both doing a little better. I hope you enjoyed it – it sounds lovely. Castle! My husband and I are both really enjoying Castle. Glad you are, too! And both the pictures and the sweater are lovely. Day off = jammies on. That’s how I know I’m having one. Thanks for including the photo showing exactly how you tension the yarn. I don’t do it that way but I may try it. I think the day off was smart. You must recharge. Really truly. Even machines recharge. I generally consider it a pretty successful day if I stay in my jammies all day long. I hope you had lovely weather too! Cool!! Photos! Artwork of Artwork. I could almost ‘feel’ the fibers. Thank you, ladies of leisure. For the next few days I’m forced to take some days off because of foot surgery. My sister is taking care of me for three days and I get to knit and knit and knit. Not as good as a rest with both feet working but it will do. Oh my gosh!!! You two so TOTALLY deserve a day off. You really need to do that more often……at least quarterly at first and then move up to once a month, then weekly eventually! Wish I was going to Madrona and Sock Camp. I’ve been so sad that I’m going to miss out on being at Port Ludlow again…..what an incredible and peaceful place. I just love how the inside looks! Very pretty! As if you weren’t cool enough with all of your knitterly knowledge and stuff. But SG-U? For serious? I heart you! Now I shall go and watch some Gate. Because, well….because I can. I never would have known about the jammies if you hadn’t mentioned them. Besides, there’s no judging here! It’s your [virtual] living room – if we don’t like what we see, we’re always able to go home again. Just blame that double post of mine on some sort of black hole vortex thing. K? You and Tina make an awesome team! But then again you already knew that. A whole day off? Really? I have fantasies about such a thing. My kids are grown/big, but still no day off. Recently my “day off” fantasies have included me going to a hotel. I live in a little city with a hotel on the beach. My fantasy has not yet come to grips with the fact that 3 days will be needed. 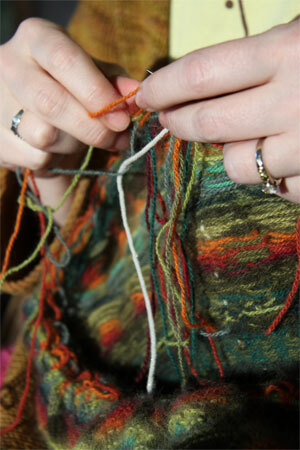 I love seeing the Bogus in progress – such lovely colours and warm-looking fuzziness! Makes me keen to start on my Olympic colourwork. Oh Man! Those colors are just stunning! I have to confess though, the thought of weaving in all those ends gives me the willies!!!! Nathan Fillion however is very, very, fine and I could watch him all day. I love this time of year. This is the time of year where you are supposed to spend a day knitting or spinning, and watching movies or listening to a book on CD. It’s the only reason to look forward to January, February, and early March. There are no really big “clean your house and decorate” holidays, and you don’t have to worry about yard work because there isn’t any except for shoveling snow. Great pictures and congratulations on your day off and your sweater. Happy Knitting! Good to see you being good to yourself! Beautiful pics…I love to see hands at work! A Bohus is a true thing of beauty and I will never own one cause it would drive me absolutely batty to knit it 🙂 Glad to hear you gave yourself a day off. Beautiful work, and how lovely to have a day to just kick back and enjoy yourself!!! The Bohus is looking gorgeous and that’s not just the fabulous photography. The sweater is just gorgeous! What a perfect thing to knit on a day off! Tina did a wonderful job capturing the luminescence of the colors in Wild Apple. And how they seem to dance and vary in intensity with changing light. Thanks for being generous and sharing your well deserved day off. Tina’s photos of the Wild Apples are so much better than the ones on the Bohus site. I was wondering why this particular sweater was so popular, because the colors were not particularly vibrant or exciting on my monitor. Obviously they are. It just took some different photos to make that clear. Gawd, that’s gorgeous. I have Scilla in my queue. I keep thinking I should wait until my stranding improves (and then there’s the whole time and budget thing), but I’m not sure I can wait much longer. Congratulations on a well-deserved day off! I like the pink gnome PJ bottoms. The Bohus looks so warm and fuzzy. Perfect cozy knitting for a day off. Glad you had a relaxing day. The Bohus is absolutely gorgeous! Hope you and Tina enjoyed your day off!! So pretty. Makes me sort of want to cast one on myself! Huzzah for taking the day off. I so get what you mean about the usual self-employed’s day off meaning “working less hard than usual” and applaud you for taking some downtime. Thanks too for the Castle link. It’s not a show I’ve heard of (I am outside the TV loop) and it looks cool. I’ll have to check it out. You have the fun part almost done. Watching the design come to life is so interesting. Now for the boring miles and miles of SS on very little needles. I too love the colorwork, but get tired of the rest of it. 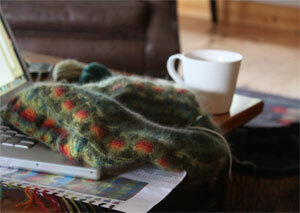 My Bohus style (from Poems in Color) sits hibernating with about 5 inches of the body done. Lovely, gorgeous, yummy sweater. Sounds like a great day! And Castle? Mmmm, Nathan Fillion. Love that man. I especially love the photos of your hands at work and the amazing interweaving of colors. Glad you and Tina are having some time just for you. What beautiful pictures, the colors are just amazing. I’m so jealous – the two of you together are such fun, just watching from the outside was a kick, can’t imagine being you. 😉 Hopefully I’ll see you at Madrona! This sweater is gorgeous – I love the reds and pinks with the greens, and yet they sneak other tones in there too, to hold everything together. Since I work a government schedule (but still salaried, so I can’t always leave when the day is over), I try to leave the office on time when there aren’t any big projects going and take at least one weekend day off. How lovely to have a friend goad you into it and stick by your side the entire time! Beautiful! I am so intimidated by color knitting. I think I just have to jump into it. Congrats on the Day Off…you’ve earned it! And Wild Apples is looking gorgeous. Gorgeous. Love that sweater. Bet you’re at the hem by the end of the retreat! Beautiful Bohus–looks just like you. Here in Michigan we are in the process of getting snowed in for the first time this winter(and it February so this is a really unusual weather pattern for us). So, my husband has declared today a crossword puzzle day (his thing) and I am having a knitting day. Who says winter can’t be fun ???? My daughter lives 20 minutes south of Washington, D.C. and they are still digging out from under 30 inches. A really, really unusual winter pattern for them–but being of Michigan stock, she just smiles and snuggles in with her family. My daughter has the same jammies – wears them to swim practice – can’t imagine a better way to spend a day (knitting in jammies, not going to swim practice at 5 am)!! So beautiful! I would love to see a video of you knitting this, actually. I’m curious to see the lever style while using circulars and dpns. I can’t imagine how that works. It’s lovely! That’s my very very favorite Bohus. So glad you enjoyed your day off! I did the same thing – a day off – for the first time in my 57 years last week! Only I took TWO days off – too many balls (yarn and otherwise) bouncing in the air of my life and I was stressing out and getting down right depressed. So I decided to take 2 sick days and stay home doing nothing! – except knitting and watching old movies. The best part was at the end of the 1st day, I knew I was going to get to do it again the next day! It was glorious! Finished some socks, started some baby booties, planned my Ravelympics project and never, never washed a dish, picked up the laundry or cooked. I came back to work on Thurs feeling rested for the first time in a long time. Whoohoo!! It pays to go “toes up” once in a while!!! Seriously. A day off spent with a friend is the best, isn’t it? I’m drinking some coffee, but I’ll admit, it was those pretty photos that woke me up today! Looking lovely! Those colors just pop off my screen — excellent! And I love the idea of that T-shirt . . . must get one. The pictures and the sweater are beautiful! Maybe someday I will have the courage and ability to tackle something that challenging. Kudos for taking a day just for you. Your day off sounds heavenly and the bohus photos are luminous. Wow. I knew the Bohus was special but I had no idea it was like THAT. Like a previous commenter, I feel a little faint looking at all those yarn ends. Can you tell us more about the Bohus technique–I mean, those of us who are still ignorant of the details? What makes it so much more complicated (and beautiful) than other kinds of colorwork? Glad you got a little break. Oh criminy. That is just so pretty. I’m going to be defending my PhD this spring, and I decided I’m going to buy some expensive sweater yarn as a gift to myself. I think…I think I want a Wild Apple. 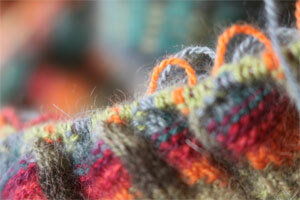 Sometimes I catch a glimpse of my knitting hands in reflection. It always surprises and mesmerizes me. The way they move so sure and with such grace I don’t know who they belong to really. Some confident person who knows what she is doing ownes those hands, not me. Your pictures reminded me of that. Oh, how Tina loves lovely colors. The Wild Apples colors dance before the eyes. They could make a memorable BMFA STR colorway. That is just so beautiful. I love the halo. But tell me, when you put it down on the laptop, doesn’t it shed into the keyboard? Or is it not very sheddy angora? I want to make on of those someday! How is the Bohus so far along, so fast? Is this something to do with a time warp or a star gate? And you’ve been completing other work simultaneously – clones, maybe? Nanites? I’ve just started the Arwen cardigan, but I can’t even think about trying it in the Knitting Olympics, because the time frame is too short. (It’s going to take months, even without the nervous breakdown when I learn all the new techniques). And it’s solid, not the gorgeous color riot you’re doing. Gotta be nanites. With little tiny needles. beautiful photos. a sweater in progress is an amazing thing. if only all those muggles out there could really appreciate it. 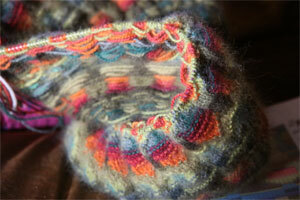 I love pictures of knitting..yarn is so fuzzy and pretty, and the little stitches are like mosaics. yay beer! yay Tina! yay pajamas! I love those knitting bags you posted pics of, the ones you were packing your knitting in for traveling? I MUST HAVE SOME, where oh where did you get them? The bohus is beautiful and the color choices were brilliant. Thank you for sharing. Good on you! I think you could and should get used to it. Make the time to do it when you can, that’s what I say! I will see you at Madrona! I’m so excited I could pee my pants! So pretty–Hey, congrats to you Canadians on the Olympics. We (my family) visited Vancouver last July, on Canada Day, and had a grand time. I can’t think of a better place to have them. A little late to the oo and ahh party, but Ooo! Ahh! That Bohus is gorgeous (although I’m still smitten with that other Bohus of yours). One day – once I have tenure and daughters who don’t want to be near me quite so much – I will knit a Bohus. In the meantime, I look forward to your Olympic quest and ultimate victory. I like to think of myself as the (Olympic) village idiot – there for cheering, humor and debauchery. Have you started your February socks yet? I love admiring your work, one day in the near future I am going to make myself try knitting socks! 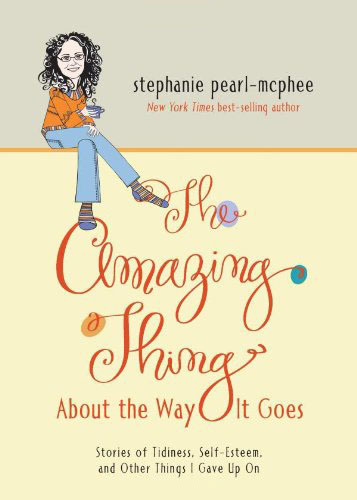 I love your cite, I have read all of your posts (yes from the beginning), I just started reading it in October. Keep up the good work! I love seeing complicated-looking knitting, especially when I don’t have to worry about knitting it myself or how it’s going to turn out. That bohus and those colors are really beautiful. I hate to ask, but what is Madrona? This new bohus is stunning. The colors are incredible. Thanks for sharing. Wow! Gorgeous! Please thank Tina for sharing her photographic talent — is there anything that woman cannot do?!? Yea! SG-U and Castle. Lovely sweater. Beautiful sweater and fantastic photography. It sounds like a lovely day off for both of you! Wow! This is something!!! I’m amazed. Stop with the bohus p0rn. It’s too beautiful. I’m not starting mine yet. Nope. Nosiree. You know what would be really GREAT? If a famous Canadian knitter and maybe one of her friends would knit matching sweaters for Alexandre and Fredrick Bilodeau? That is the sweetest story I have ever heard in Olympic history. Maybe if that knitter had experience with a friend, say perhaps she and a friend had maybe tried to knit matching sweaters for a Bride and Groom. Maybe they learned valuable lessons from that experience and wanted to try again. OH CANADA! You have a wonderful story here! I cried and prayed when I saw it. We should all try to learn from Fredrick and Alexander about making the most of every day and going WAY beyond what is expected of us.